A Japanese proposal to stop using swastikas to identify temples on tourist maps has sparked a backlash. Japan's official map-making body said foreigners might mistake it for a Nazi symbol, and that temples should be represented by a three-storey pagoda instead. It is one of six map symbols the Geospatial Information Authority of Japan (GSI) has proposed dropping, as Japan prepares for the 2020 Tokyo Olympics. The GSI came up with the suggestions after speaking to experts and surveying more than 1,000 people, including tourists, embassy officials and foreign students. It is conducting a public consultation before making an official decision, but some people in Japan are not happy. Many say the ancient Sanskrit symbol - which has been adopted into Japanese where it is pronounced manji - has long been associated with Buddhism and Japanese culture, and that the tourists should learn this. In this tweet, Twitter user Fei Explorer linked to a news article on the change and asked rhetorically: "So if terrorists hang up the Union Jack, does this mean the UK should change its flag? Or the USA or Australia?" Another Twitter user, Konosaki Lem, said: "It's said some would mistake the manji for the Nazi symbol, but Buddhism has a much longer history with this symbol. So I strongly oppose changing our maps for some foreigners who are ignorant and extremely stupid. The idea is foolish." GSI's executive officer for national mapping, Takayuki Nakamura, acknowledged the controversy, but said some people wanted to go even further. He told the Japan Times: "Some say we should change symbols for Japanese-language maps at this opportunity, while others say the traditional symbols should stay. Either way, it will take a while before any changes are made, as we need to co-ordinate with related government agencies." Other symbols that will be changed for foreigners maps include that for a hotel, which GSI admitted looked like the symbol for helipads. The church symbol could be mistaken for a graveyard, added the agency. Meanwhile, some respondents to the GSI survey thought the symbol for a hospital looked too much like a shield. Then there were uniquely Japanese symbols that baffled some, such as that for post offices. The symbol is derived from an old Japanese term dating back to the 19th Century meaning "communication". The giant X symbol for police station actually represents two police batons crossing each other, but also confused many. It would be replaced by a saluting policeman. 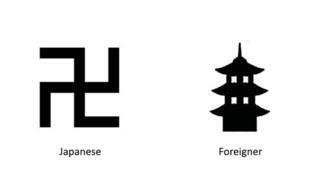 The rest of the 18 symbols are either new ones that will be used exclusively for foreign-language maps to denote places like public bathrooms or restaurants, or existing ones that will be used for both Japanese and foreign maps. The symbol for hot springs will remain as it is, much to the amusement of some who have pointed out that it looks like another quintessential Japanese icon - a steaming bowl of miso soup.